If you like wine bottle craft ideas, you'll love wine cork craft ideas too! 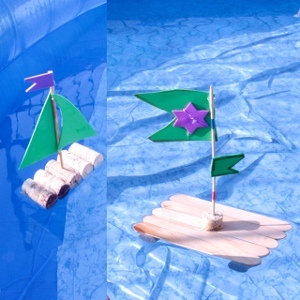 After you make crafts with the bottles, turn the corks into something fun too, like these wine cork sail boats, perfect for the kids to take in the bath. Find this wine bottle project plus many more in our free eBook, 25 Cool Things to Do with Wine Bottles. Stick the skewer into the wine cork for the mast. Draw some sail/flag shapes on craft foam and cut them out. Find the nearest body of water and enjoy. Ahhhhhhh. Just looking at these photos is refreshing!